After breakfast the guides picked up our bags and we headed down to the car. Kelly did a quick check and found out that we had a flat tire, luck for us we were still at the lodge and a couple of the guides from the lodge jumped in and changed it for us. We are carrying two spare tyres, one almost bald (note to self: whenever you rent a car in Namibia double check the tread on any spares they give you), so we decided to stop at the first town on our route, a small place called Outjo on the C38, about 97 kilometres from the Ongava Lodge but tar road all the way. After thanking the guys for changing our tyre and giving them a good tip for doing so we headed out. About 30 kilometres out from the lodge and we haven’t seen a single car yet, only a goat herder and his goats. It’s all low scrub with some hills a couple of kilometres off off from the road. There are lots of signs indicating lodges and safari camps hidden away in the bush. They seem to be everywhere. Woops! Just passed a sign that read “Road Experiment” !!!!! I wonder what that means? Outjo is a small ranching town of approximately 5,000 people and the name translates to “place on the rocks” or “little hill” referring to the area’s hilly topography. We pulled into the Engen station to fill up and get the tyre fixed. While we were waiting for the tyre to be repaired Kelly went off to checked out the local African curio shop and I went up the road to the Bakery. As Namibia was once a German colony all of the towns have their bakeries that produce a range of german style pasteries such as strudel. Kelly bought a Kuba, a beautiful African patterned cloth, about 2.5 metres long. She found it amongst some of the same old collection of souvenirs you see in each town, now me, I bought a chocolate strudel. Before leaving we took a bit of a drive around the town and I found a couple of eating establishments, the first, the Grill Box, does Biltong and Droëwors (cured meat usually beef or game similar to jerky and dried coriander-seed spiced boerewors sausage), I love how they built it around the palm tree! The second establishment was the aptly named "Casino Royale" or is it "Casino Royal"? After about spending an hour in Outjo we got back on the road and headed west to Khorixas. Even though it was a bit cooler than yesterday it was still pretty hot and the number of rest stops certainly encourage you to pull over and have a cold drink. Khorixas use to be the administrative capital of the old “Homeland” of Damaraland but apparently it’s not so important now and the town looks like it's seen better days. We did a top up as there are no more gas stations on the way to Mowani and then proceeded to get lost but finally found our way out of town. About 5k from the town the tar finishes and it’s gravel roads for the next 90k all the way to Mowani. Along the road there were numerous signs of those who never made it, and the occasional shredded tyre by the road testified to the harsh environment we were driving through. The area we are travelling through is communal land and and we have been told to keep a sharp eye out for donkeys, goats and cows on the roads. It's a bit different from Australia where you are always on the lookout for Kangaroos. Along the road are various craft stands in different states of repair, but one of them, incorporating a bar looked pretty interesting. 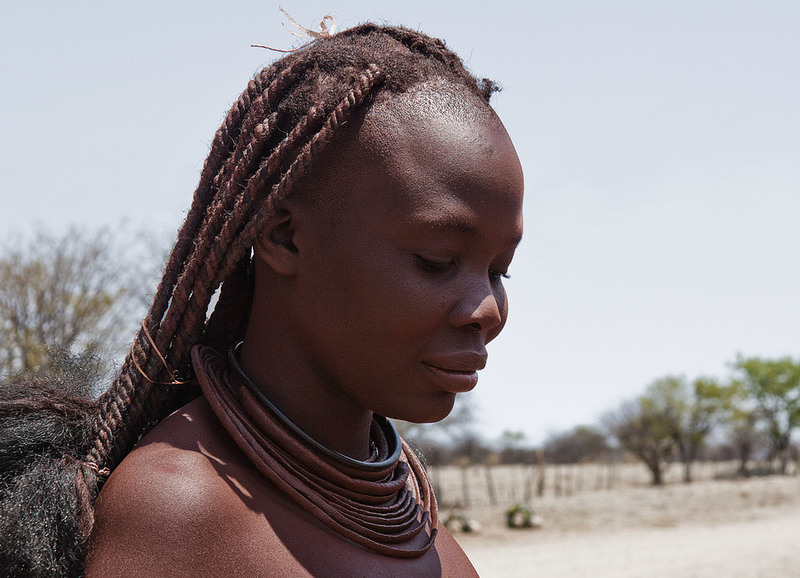 I pulled up and about a minute later a Himba woman came out to show me the different crafts she had for sale. The Himba wear little clothing, but the women are famous for covering themselves with otjize, a mixture of butter fat and ochre, to protect themselves from the sun. The mixture gives their skins a reddish tinge. This symbolizes earth's rich red color and the blood that symbolizes life, and is consistent with the Himba ideal of beauty. Women braid each other's hair and cover it in their ochre mixture. It is taboo for Himba women to wash with water, and so to cleanse themselves, they reapply a fresh layer of otjize each morning. They also use smoke from smouldering specific herbs and plants to “cleanse” and perfume themselves and their clothing. 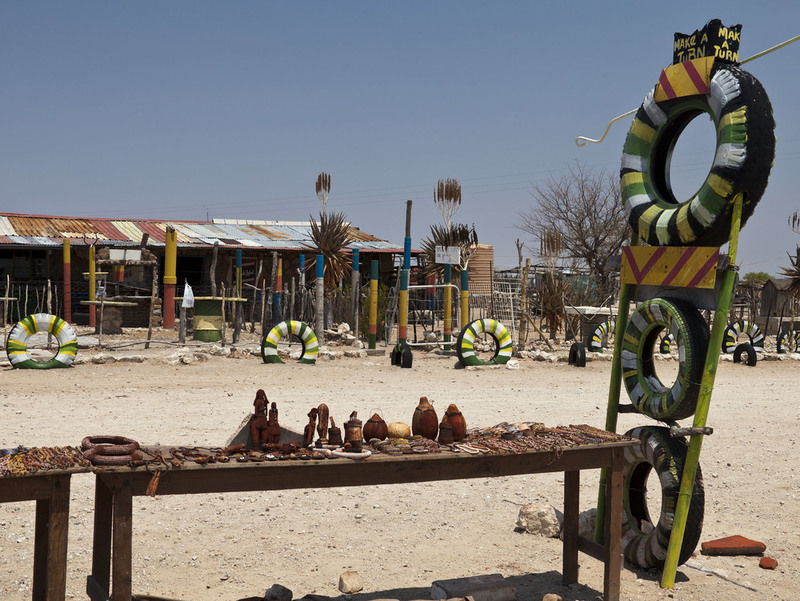 About 42 kilometres west of Khorixas is a spot called the Petrified Forest. This area contains a number of petrified trees that were carried here as logs by an ancient river some 250 million years ago only to be stranded on a sandbank. 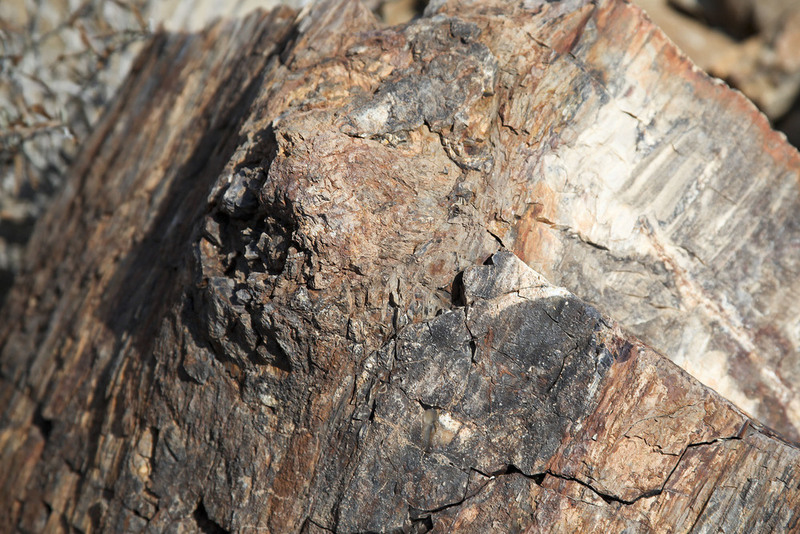 Subsequently the sand was deposited around them, creating the conditions for the cells of the wood to be replaced by silica, and thus become petrified. We pulled into the small carpark and booked ourselves a tour with a guide. Our guide was a young man named Ben-onie and he was a fantastic guide and had a great deal of knowledge about the petrified trees and the local area. I’d never really seen petrified wood before, especially in such good condition, you would swear it’s timber until you actually touch it and realise that it’s all stone. The examples retained so much of the original timbers grain and quality. In this image you can clearly see where the branch has been broken off the original trunk. 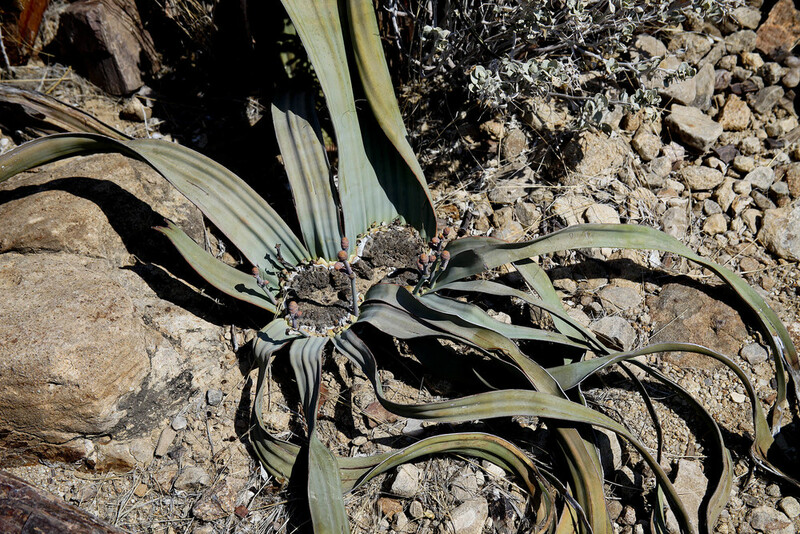 Another feature Ben-onie pointed out to us was the world’s oldest plant the Welwtischia. The age of the plants is difficult to assess, but they are very long-lived, living 1000 years or more. Some individuals may be more than 2000 years old! We finish up the tour and Ben-onie asks us where we are heading and we tell him Mowani. 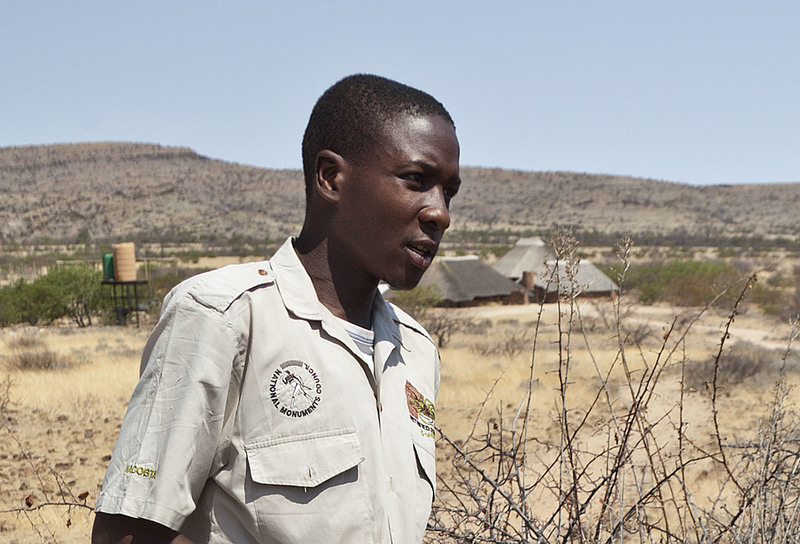 He lets us know that his brother, Moses, is a guide at Mowani and we promise to say hi to him when we see him. So it’s back on the road and we keep heading west to the turnoff onto route D2612 to Twyfelfontein. Along the way we come across some donkeys and pass a number of ramshackle houses. As we get closer to Mowani we can see the large rocky mountains clearly now and it’s not long before we reach the turnoff to Mowani at about 4:30pm. After about 3 kilometres we pull up to a gatehouse and a mad Namibian called Heindrick jumps out and enthusiastically welcomes us to Mowani, shakes our hands and tells us to head up the track a few more kilometres. The whole landscape is full of these huge boulders and it’s very surreal. As we drive up we are met and welcomed to the main lodge. First on the agenda is our briefing, meal times, activities, sundowner time etc. Once all the formalities are done we are shown to our room the mini suite. Mowani accommodation is mainly tented but there is a main and mini suite. When we were trying to book the only thing available was the mini suite, even though we really wanted a tent as we felt the tented option was much more in keeping with the environment of Mowani. Despite that the mini suite was very cool with an entrance room, with TV, that we never actually turned on, a main bedroom, outside loo and shower, and two outside areas with table and chairs. Unfortunately the main view was back over the generator and car park but hell you just have to make the most of it and I thought it was okay. Note: For those of you thinking of staying at Mowani a little look around later revealed that the best bet would be a tent numbered from 1 to 4 as they seem to have the best views.